As per usual I got lost in the flower section of my local grocery store and I found a great deal on a stem of yellow/green orchids. 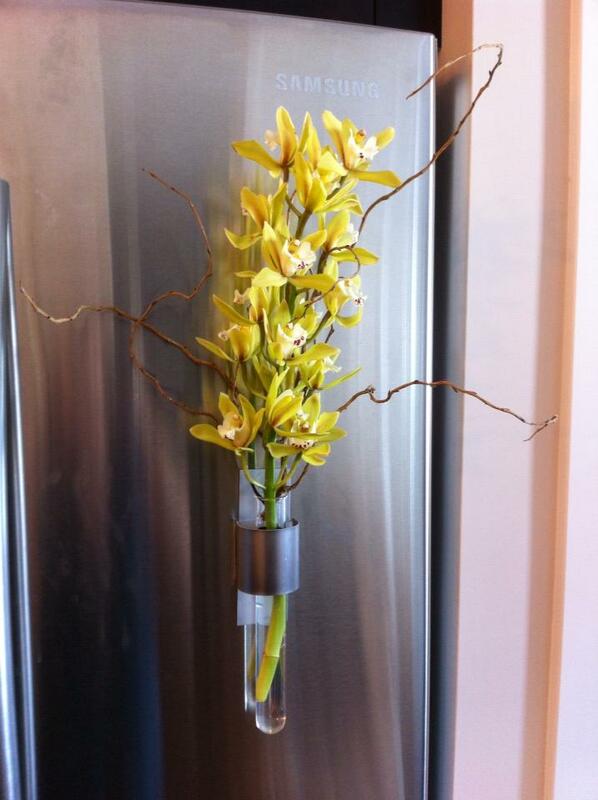 The stem was beautiful and had about 20 orchids for only $7.99. I couldn't leave without it. It was the perfect size for my fridge vase. Originally I put the full stem in the vase with dried curly willow but the stem was too heavy. I left it hanging for a few days but later the top started to droop and it didn't look as good anymore. So I had a great idea to steal some of its flowers and break it up into more sassy arrangements. I removed eight flowers from the stem, some from the top and some from the bottom to keep the big stem even. With the eight stand alone flowers I created these cute little sassy arrangements. They look super cute on my kitchen island.